Carnival Horizon which is the newest ship in the fleet is currently suffering from technical issues. Due to this, the large ship was unable to make the scheduled call in Amber Cove in the Dominican Republic. At the moment the Carnival cruise ship is suffering from technical issues and instead of a scheduled port of call in Amber Cove today the ship is spending a day at sea. 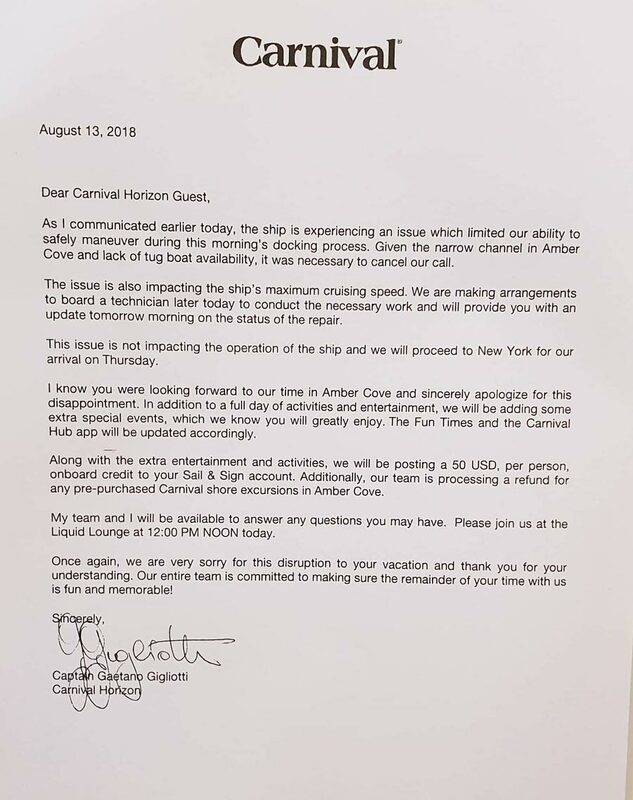 A letter was delivered to all guests onboard explaining the problem and that it would be fixed. Tragedy has also hit the Carnival ship during the same cruise with a crew member passing away, read about it here. The issue is related to the ship propulsion and wasn’t able to maneuver during the Amber Cove docking process in the morning. The Carnival Horizon is also unable to sail at the maximum cruising speed and the cruise line is working on fixing the issue. This will mean that the ship will be cruising much slower than usual but due to missing Amber Cove, the arrival back in New York will still be fine. Further updates will be announced to guests tomorrow morning on the repair status. As a result of guests missing their day in Amber Cove Carnival will be compensating with a $50 credit per person to the Sail & Sign account. All booked shore excursions are also being refunded. Extra events and activities have been put on by the entertainment department and the Carnival Hub App is being updated for this too. The vessel which only entered service in Spring 2018 is sailing am an 8-night Eastern Caribbean cruise. The departed New York on August 8 and is expected back as normal on August 16. The ship is 133,500 gross tons and has a passenger capacity of 3,960. Unfortunately, these problems related to propulsion have occurred before on other ships in the fleet. In 2017 the Carnival Fantasy was hit with issues and in the same year, Carnival Splendor suffered from a similar problem.